I’ve always considered myself a people person. I’m not shy by any means. As a child growing up in New York, I dreamed of being a famous actress. I would put on performances for my family on our stoop, singing and dancing, pretending to be on a Broadway stage. I loved living in a big city. When I was a teenager, my family decamped to Long Island, or as we city kids referred to it, “the country.” Truth be told, it wasn’t farms and cows; but having grown up around taxis, alleyways, and subways, I was definitely in culture shock. Those first days of high school were interesting. People would approach me not so much because I was the new girl, but because I was from “the City,” which was almost, as I understood it, like being from a foreign country. Over the years, I continued to dream of performing. I took drama classes and acted in school plays. I loved it: the adrenaline rush of opening night; the excitement backstage as you waited for your cue to step out into the spotlight. Looking back, I realize now what I loved the most was how the performances made the audience feel, more so than how it made me feel. My performances offered the audience an escape from the mundane and made them smile. For three acts, they could forget their day-to-day life and the challenges that came with it. If they were struggling, they could relate to a character I was portraying and feel a little less alone. I saw performing as a way to do good, to give something back to the people who came to see me. And that made me feel great. Since my theater days, I’ve played quite a few roles. I’ve worked for law firms, insurance companies, financial institutions, and equipment distributors. I’ve held positions in human resources, marketing, and project management, to name a few. I’ve managed large teams and given countless presentations. Through it all, one thing has remained a constant: the desire to give back, the need to make a difference. In fact, that desire was so strong in me that I helped my company develop a program to help the communities around us that’s now in its 11th year. If you’ve picked up this book, chances are you have a passion for serving others, but you’re not quite sure how to get started. Perhaps you’ve been researching current issues in your community and want to help solve them, but the prospect of actually diving in and taking action feels huge and overwhelming. Maybe you’re already involved as a volunteer and want to inspire your peers to join you. Maybe you’re an HR leader looking for a way to breathe life into your company’s culture. Or perhaps you’re a CEO who wants to prepare your company to step up to the challenge of changing the world. Sound like you? Then you’ve found the right book; or, perhaps, the right book has found you. 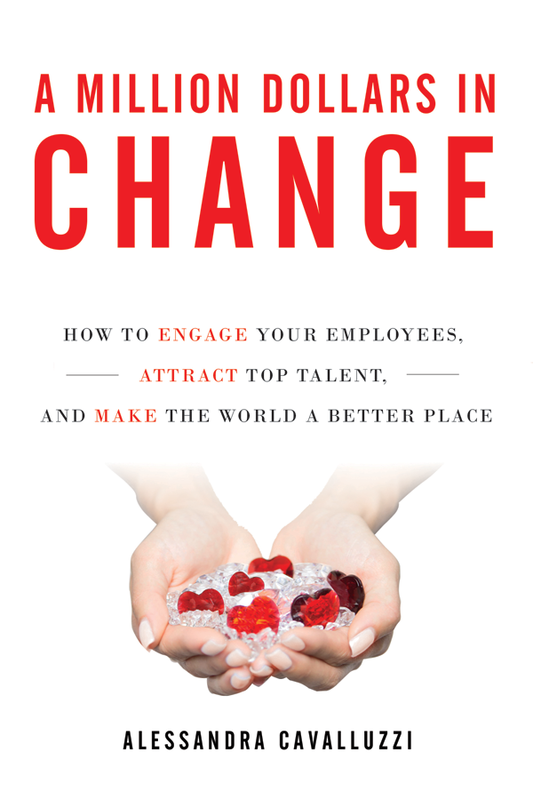 A Million Dollars in Change will show you how to energize your employees, build a better company, and improve your community by creating a workplace giving program. In the course of this book, we’ll talk about charitable giving (also known as corporate philanthropy) and corporate social responsibility (CSR). Now, I’ve seen them used interchangeably, and I’ve seen them described as completely different animals. The truth is, they are not exclusive of each other, but they are a little bit different. Charitable giving encompasses donations or grants made to a nonprofit organization. If you’ve ever made a donation to fund cancer research, for instance, this is a form of charitable giving. Corporate social responsibility, on the other hand, can include philanthropy, but these programs have other functions, too. A company might design a CSR program, for instance, to improve the well-being of its employees, the environment, and the community around it. A company with a CSR program might partner with a nonprofit to keep at-risk teens in school by enrolling them in training and educational programs. Maybe a company gives young adults in underserved communities internships to learn marketable skills. Perhaps employees volunteer their time and talent to help a local nonprofit. It’s not uncommon for a company with a CSR program to reduce its carbon footprint by making changes like installing solar panels or energy efficient lighting, or doing away with Styrofoam in your packaging. All of these are examples of CSR. The important thing to remember is that your program doesn’t need to be one or the other to be successful. Which term you use to describe your program will depend on whether you decide to go strictly with philanthropy, create a full CSR plan, or maybe you even develop a hybrid—donations plus action. At my company, we use the term “charitable giving” even though we incorporated volunteerism and some of the other aspects of CSR. Charitable giving most accurately reflected where our focus was, and so that felt right to us. Also, as I was developing our program I knew that we would not be able to implement a full-blown CSR program right out of the gate because that type of program would require a much bigger investment, and that would have made it harder to get the initial funding we needed to get off the ground. So we started with a charitable giving program that we could scale up in the future, leaving us plenty of runway for growth. Many business leaders and HR professionals have told me over the years that they want to launch a charitable giving or CSR program in their company, but they feel intimidated and don’t know where to begin. I’ve been approached by people who have told me the that they want to embed the values of service and community into their organization to create a “giving culture,” but they fear they will come up against resistance, either from employees or management. Others have worried they are “just one voice” and don’t think that they’ll be taken seriously. In the following chapters, I’ll debunk these myths and show you, for once and for all, that developing a charitable giving program is as good for your company as it is for your community—and it doesn’t need as much in startup funds as you might think. In fact, many aspects of these programs can be done at little or no cost to your company. As for your doubts and fears? I had them, too. But the good news is that creating a workplace charitable giving program isn’t as hard as you think. The even better news is that I’m going to tell you how to do it. And the best news of all? There are things you can do to right out of the gate that don’t require a big investment that will make you look like a rock star. Twelve years ago, before I had the green light from my higher-ups, support from my colleagues, or a dime of funding, all I had was a vision, and a pretty broad one at that. I wanted to take my company’s charitable giving program to the next level, and I wanted this bigger and better program to make our employees proud, attract the best people to our company, and help others in the process. I wanted a program that reflected our awesome company culture and enabled us to take it outside our walls and into the community . I wanted to combine charitable giving with opportunities for our employees to be hands-on agents of change. I knew that volunteering was a perfect way to do this, and I was eager to introduce this concept to my company. I had ideas for working with nonprofits to help solve issues that our communities face each and every day: homelessness, veteran unemployment, illiteracy, and poverty. I knew what I wanted to do. I just had to figure out how to do it. I began searching online for information on how to develop and implement a corporate giving program, but all I could find was data on why it was critical for companies to adopt giving or CSR as part of their strategy. I came across plenty of great articles and reports that talked about the benefits of having a CSR program, and the consequences of not adopting a CSR strategy as part of a business strategy. I read all about “social investing” and “social enterprise.” But for someone starting from square one, I found this information to be too complex and completely overwhelming. I realized soon enough that I was pretty much on my own. I thought, “I could just forget this idea, or, I could take a chance and try to do this myself.” In the end I decided on the latter, and I set out to develop a plan to build a workplace giving program for my company. What started as a journey to create a program led to the creation of a department and a new career path for me. Over the years, I’ve been told by nonprofits and community organizations alike that the program in place at my company is unique not so much because of its structure, but because of how we engage our employees. One of the things that makes our program different from most is that it’s not micromanaged by our main office. Although the program is run out of our corporate HQ, it involves employees at all levels of the company in all of our locations. We have dedicated employee volunteers that serve on what we call “community outreach teams” that help us plan and execute various programs and events throughout the year in partnership with a wide variety of nonprofits. Time and again I am told that our philosophy towards community service, our culture for giving, and our hands-on approach to support is refreshing. No matter where you are or what size your company is, A Million Dollars in Change will help you develop a program that’s right for your business and your community. It doesn’t matter what language you speak or which continent you’re on. The program you design will be successful, because at its very core is your desire to help others and make the world a better place. You might not realize it now, but that desire is universal. In the course of our work together, you’ll learn how to customize a program to fit your company’s culture, its mission, and most importantly its budget. What you’ll create won’t just be a corporate giving program, but a company culture of giving. Is it possible to change the world one company at a time? Absolutely, and this book will show you how. Whether you're a CEO, a human resources professional, or a leader dedicated to making a difference, A Million Dollars in Change will show you how to help make your company a great place to work by making your community a better place to live. © 2016 Alessandra Cavalluzzi. All Rights Reserved.